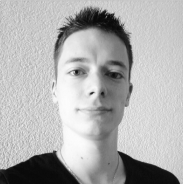 Matthieu Taggiasco Developer at Equinoxe MIS. Scala enthusiast. Dad of two beautiful boys. My name is Matthieu Taggiasco and I live in Switzerland. I am maried and have two adorable sons. I studied Computer Science at the EPFL. I currently work at Equinoxe MIS Development, where I mainly do PL/SQL, XSLT and a bit of Scala programing. Since the end of my studies I develop a great interest in functional programing and particularly in Scala. You will find different things here : first a list of projects I worked on. The projects descriptions come from my old website, which means there are almost all in French only. But I'll translate them as soon as I have time. Then, you can find a non-exhaustive list of Scala libraries. These come from friends emails or tweets I read. Some are maybe not maintened or do not exist anymore, in this case feel free to contact me and report the case. Eventually I hope I will find enough time to write an article with screenshots of all my website's previous versions.